After years of waiting Google Shopping has finally arrived in Ireland. This is one of the biggest changes from AdWords that we have seen in Ireland for quite some time. Companies and Digital Marketers will now be able to feature dynamic product adverts that are shown in the search results pages. See an example of what they will look like below. Here at Finn Media we are currently working with our Ecommerce clients to help them promote their products to consumers who can compare, search and click directly to purchase. 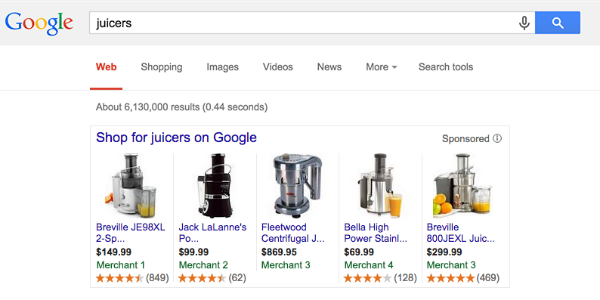 What exactly is Google Shopping? Google Shopping is a retail platform that allows you to compare and search for products in terms of their availability, location and price in Ireland and abroad. This will allow shoppers to find your products quickly and easily and will also enable you attract more potential buyers. You will also be able to control the information of your products so customers can find the products that are relevent to what they are searching for. There are many benefits to running shopping campaigns, we have listed some below. Increase in traffic: a large number of businesses experience a much higher CTR (click through rate) with shopping ads compared to text ads that are shown in the same location for searches related to shopping. Much wider presence: more than one of your ads can appear for a search if relevant a text ad and a shopping can also appear at the same time. This means your reach for just a single search could double giving you a much wider online presence. High Conversion rates: your product ads go directly to your product page meaning the conversion rate can be quite high. Easy Targeting: Google will automatically select the most relevant products to show the shopper so you don’t need to create keyword and ads manually. If you feel that Google Shopping ads will benefit your e-commerce site then next step is to set up your Merchant Centre Account. If you don’t already have a Google AdWords account you must get one set up. You then link your Merchant Centre account with your Google AdWords account. Once you have the two accounts linked you can start taking advantage of retail-centric AdWords campaign tools to increase and improve your presence on the web. If you want to more about Google Shopping and how to set up your Google Merchant Centre account please get in touch here.